FTC disclaimer: I received the photo frames from Reed & Barton in exchange for this post. All ideas and opinions are my own. Post contains affiliate links. When I was planning my wedding, I spent hours online trying to find ideas to honor both of my parents at my wedding. 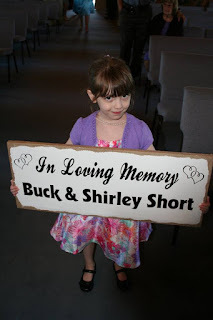 I found ideas to honor a parent who is deceased, but no ideas when you are trying to honor both parents. I spent almost more time on this part of wedding planning than any other. I wanted to do something touching, have them a part of the ceremony, but didn’t want to turn the celebration into a memorial. We started by having a page each in our wedding bulletins in memory of them. We included biographical information, a fun story, a photo individually and their wedding photo which my husband and I recreated at the cake cutting. I saw ideas online for candles, jewelry, and other memorial ideas, but nothing really stood out to me -- I wanted the idea to be personal. Eventually, I had an idea, and since I saw nothing online like what I wanted to do, so I asked Reed & Barton if they would want to be a part of this. Then I had a photo of each of my parents in a Reed & Barton Addison photo frame. This was also displayed as everyone came into the church near the guest book. Then, instead of walking me down the aisle, my “parents” went in right before the flower girl. One child carried the sign into the church, another carried my mother’s photo, and another carried Dad’s photo. These were placed on the front pew where they would have sat if they were still living. What is a wedding without family photos? 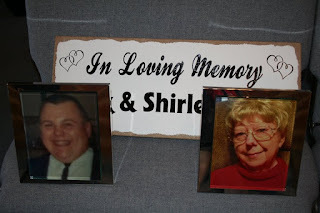 So my husband and I visited my parents' gravesite with their photos. We added flowers to their headstone, and spent a few minutes with them. Our photographer stayed out of the way and captured our time at the cemetery beautifully. Amazingly, some of our cemetery photos are my favorites from the wedding. We didn't display the in memory sign and the photos at our reception. We wanted that to be a happy occasion and didn't want to do anything that might dampen the mood. Every compliment we received about how we incorporated my parents into the wedding was very positive. We didn't want it to be a memorial service to them, but to show how much we missed them on our special day, and I feel like we succeeded. I would love some of their Austin wine glasses. I would get the Soho-pedestal-cakestand! I love Reed & Barton's Heritage Collection, especially the hammered round serving tray. They have some beautiful pieces! I like the Country French 5 piece place setting. I like the LET'S CELEBRATE picture frame. 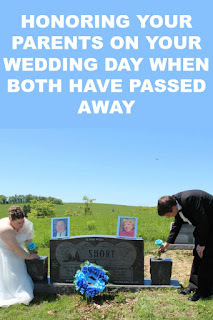 Great ideas - my brother gave me away at my wedding in honor of our Dad who had already gone to heaven. I love the frames. I love the equinox bowls!